I know. I know. The David Foster Wallace book to read is “Infinite Jest.” It’s the one prominently displayed at just about every bookstore, and it is supposed to be all smart and wonderful and interesting and mind-blowing. But I’m going to be completely honest with you. It’s a huge book. Rephrase that. It’s a massive book. I do the majority of my reading on the subway and on my lunchbreak. I carry by book du jour in my purse and pull it out when I have a free moment. Holding that gargantuan book in my hands was making my shoulder hurt. 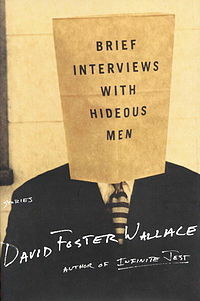 So I opted for the more dainty “Brief Interviews with Hideous Men.” And I mean, what a title, eh? It’s a book of short stories. Many of those stories are part of a series of interviews with men about their dating habits, sexual habits, fantasies. There are also a variety of short stories on other non-hideous-men related subjects. My overall feeling on this book is meh. For one thing, it was kind of depressing. A lot of his characters are depressed, depraved, corrupt, conniving. There are those types out there, but it doesn’t really do my soul good to spend hours reading about them. I’d end up putting the book down and feeling awfully cynical which is something I try to avoid. Secondly, his writing is often experimental. Perhaps this is why some people like him so much? Because he’s all outside the box and whatnot? For instance, there was one short story called “Octet.” The story is broken into eight sections, with lengthy quiz-style questions that are unanswerable. Questions about Man X and Man Y and their friendship and how things are affected by outside influences. At some point, DFW breaks down and talks about how he, as a writer, is failing with this piece. It is so shockingly bare and self-conscious, and it was kind of a cop out. I don’t know. I guess it felt like he was trying so desperately to impress the reader with his “unique” writing. That kind of thing always rubs me the wrong way. I do feel like I should give DFW a second chance though. It’s apparent that he is a good writer, and he is smart. I really should read “Infinite Jest.” Now that I have a Kindle, there is no more need to fear the damage the book will cause my shoulder. My Kindle is as light as a feather. It’ll be a while till I get to “Infinite Jest” though. I just loaded it up with books to help pass the time on that 16 hour flight I’m taking in 5 days.